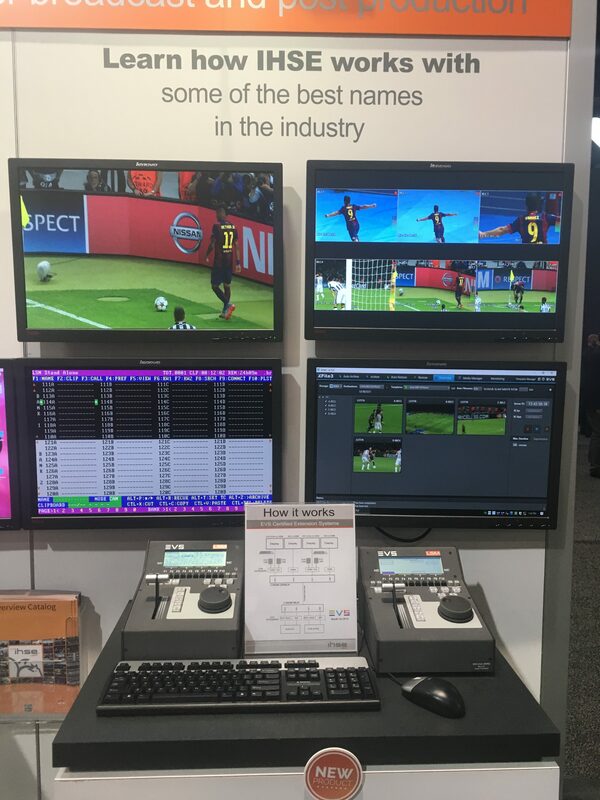 The SVG and SVG Europe editorial teams were out in full force at last week’s NAB 2018, covering the biggest sports-technology news and delivering daily “SportsTechBuzz at NAB” roundups. Here is a look at the SportsTechBuzz from South Hall. These exhibitors were located in South Hall: Adder Technology, Adobe, Akamai, Aldea, Aperi, Arvato Systems, Arista Networks, Avid Technology, AWS Elemental, Axon Digital Design, Blackmagic Design, Cisco, Cloudian, Cobalt Digital, Dalet Digital Media Systems, Deltacast, EEG Enterprises, Ericsson, EVS, FingerWorks, Fraunhofer, Friend MTS, Globecast, Grabyo, Grass Valley, Hitomi, IBM Aspera, IBM Watson, IHSE, Imagine Communications, IPtec, Limelight Networks, Marquis Broadcast, Media Links, NEP, Net Insight, Nevion, NewTek, PCCW Global, PSSI, Quantum, RT Software, Scale Logic, SES, Signiant, SportZcast, Telestream, The Switch, The Video Call Center, VITEC, Vizrt, V-Nova, Wowza Media Systems, and Yospace. FingerWorks has developed a new version of its traditional telestration product specifically for VR and AR productions, allowing content creators to add live graphics to any VR broadcast in real time. At the company’s booth, Bryan McKoen demonstrated how the tool, which is already being used by NextVR, ingests Live 360 cameras, creates a flattened UI so that the operator can view the telestrator elements without having to wear a VR headset, and outputs the VR content in real time with telestration and graphics elements placed at proper depth. In addition to the new VR system, the FingerWorks Fusion system now allows Twitter and Instagram feeds to be imported into the system from any device connected to the network, enabling broadcasters to integrate social-media content directly into the live telecast. ADDERLink Infinity 100T IP-based KVM transmitter is available in a new form factor. Adder Technology used NAB 2018 to make a “big little announcement” that its flagship product, the ADDERLink Infinity 100T IP-based KVM transmitter, is now available in a zero-U dongle. With the new form factor, users do not have to give up precious rack space to the servers and transmitters that generally power KVM. Instead, they can fit the dongle anywhere. The transmitter began shipping prior to the show and is available immediately. RT Software is showcasing its tOG-Sports Graphics AR system, which can be used as a regular analysis system during a game and can also be repurposed for AR graphics during the subsequent studio show. The AR graphics comprise video walls and giant screens that can play out analysis clips prepared earlier. tOG-Sports AR is a single PC and works with a static SDI or IP (NDI) studio camera. It comes with a complete set of popular graphics that users can customize. Installation is a simple process, and users can be operational within minutes. The package provides a comprehensive range of soccer graphics, including league tables, head-to-heads, and weekend fixtures. The style for each is configured through a web interface where multiple styles for numerous shows can be stored. Having extended the EZTV IPTV platform to include digital signage last year, VITEC has taken its flagship product a step further this year with the addition of video-wall capabilities. Now users can leverage the IPTV system on both digital signage and video walls within their venues. In addition, VITEC is spotlighting a number of its most recent sports-venue projects, including the IPTV installation at the Minnesota Vikings’ new Indoor Practice Facility in Eagan, MN. With SMPTE ST 2110 finally a reality, the IP standards suite has been the talk of NAB 2018. 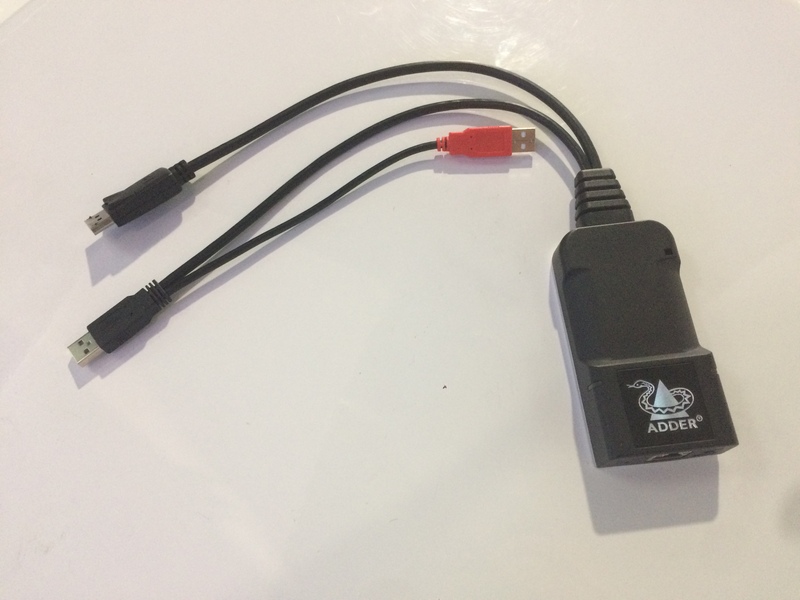 EEG Enterprises is showing off its iCap Alta IP video-caption encoder, which powers closed captioning/subtitling in IP video-production environments. The virtualized technology is compatible with SMPTE 2110 and ASPEN for IP video workflows and supports native 2110 audio/captioning exchange. Designed to bridge the gap between SDI and IP, the HD492 caption encoder is also on display. In addition, EEG is showcasing its cloud-hosted Lexi Automatic Speech Recognition Captioning, which creates a custom vocabulary based on information that users can upload. Adobe is unveiling a major update to its Adobe Creative Cloud platform, highlighted by several new automation features powered by its Adobe Sensei AI platform. 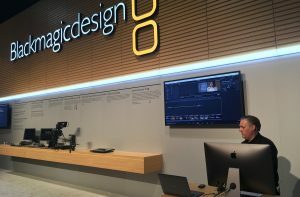 According to Steve Forde, GM, emerging products, digital video and audio, the new Color Match for Premier Pro CC matches two shots at one click, applying editable Lumetri adjustments from one clip to another to achieve visual consistency across the whole project. On the audio side, the new Sensei-enabled Autoducking feature automatically adjusts soundtrack audio around dialog, whether for a single clip or an entire Premier Pro project. In addition to the new AI functionality, the Adobe Immersive Environment VR/360 editing environment is now available in After Effects CC. Nevion is dedicating its booth to the message “The IP revolution: seize it, lead it, live it.” With the help of real-life case studies, it is focusing on standards and formats, IP LAN/WAN convergence, and virtualization. Center stage is the latest versions of Nevion’s flagship products, which are featured in all demos: Virtuoso, the software-defined media node, and VideoIPath, the orchestration and SDN-control software. Both products are designed for an environment in which the distinction between LAN used in a facility and WAN used in contribution, remote production, and distribution is becoming blurred. They are key to delivering infrastructure and media-function virtualization. PSSI has partnered with AT&T to launch its Saber (Satellite + fiBER) service, which is designed to create a redundant double-platform approach for contribution that uses a combination of C- and Ku-band satellite and fiber (leveraging AT&T’s fiber network) as well as IP public internet. PSSI’s C27 truck (equipped with a MediaLinks encoding shelf) is already deployed at NASCAR tracks each week, providing the service to NASCAR Productions and Fox Sports. According to PSSI CEO Rob Lamb, the Saber workflow operates out of a single truck and uses the mode of connectivity (fiber or satellite, depending on the situation) that delivers the highest bandwidth as the primary feed and then can failover to the other medium or to the public internet IP as a backup. IPtec’s booth offers a chance to check out the VNP-400, the newest addition to the video-network–processor product line. VP, Sales, Glen Green says that the processor supports JPEG2000, H.264, and MPEG2 contribution-quality video codecs for the transmission of real-time video and audio signals over IP networks. “It’s very flexible and supports 1080p and also has 16 channels of audio and a built-in frame synchronizer,” he adds. Also on display is the SMMT Service Management & Monitoring software, which makes it much easier for personnel to make sure IP networks are functioning properly. Aldea’s presence at NAB 2018 is highlighted by a pair of new products: a 4K contribution network, which will be used extensively in various applications for the summer’s FIFA World Cup, and the Aldea Media Cloud platform. CEO Lionel Bentolila describes the solution as an “all-encompassing platform” that includes transcoding and social-media interfacing. 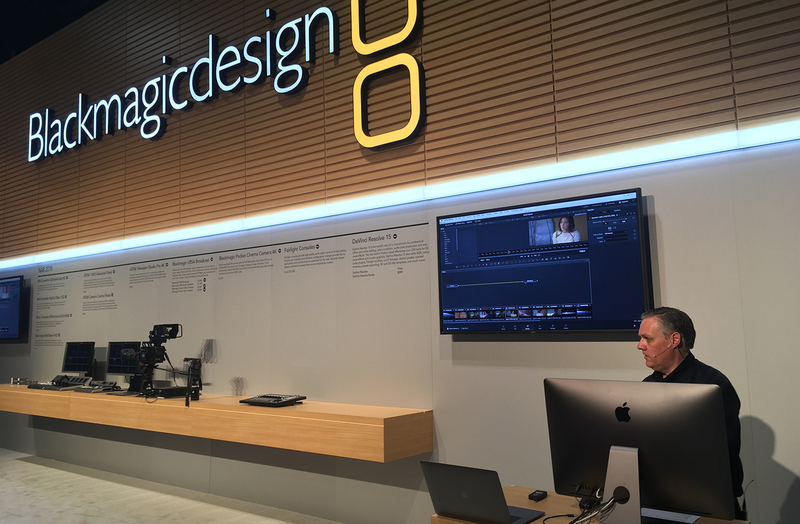 Arvato Systems’ Media Logger is making its NAB Show debut. The solution adds segmented data to a media asset. The search tool, Media Portal, is also at the booth. The company’s big announcement, though, is the launch of a self-service SaaS edition of VPMS EditMate. It’s in beta testing now and is expected to be available early this summer. There are plenty of reasons to stop by the EVS booth, such as learning more about the new Via platform that promises to transform the way the company develops and upgrades products. But one of the more attention-grabbing offerings is a demo area where attendees can get a sense of what an ESL gaming production is like. ESL production of the Intel Extreme Masters is the longest-running global pro gaming tour (12 years), and an EVS DYVI switcher with two panels is used: one panel cutting the live play from the gamers’ PCs, the other for the live programming. The demo at the EVS booth gives attendees a sense of that production as players compete live at the booth. Simon Eicher, executive producer, ESL, says that DYVI gives the ESL team the flexibility to change from one show day to the next and IPDirector provides the tools to deliver content that didn’t make it to air to fans via social-media platforms. Grass Valley VP, Live Production, Mark Hilton encourages attendees to stop by Booth SL106 not only to check out a range of new products but also to learn more about how Belden’s acquisition of SAM (Belden is Grass Valley’s parent company) will change the course of GV product design. “One of the biggest benefits of integration is, we can leverage the best minds in engineering from both companies,” says Hilton. “It’s been fun to get together with them and learn how they work.” One of the earliest results is the decision to take the best parts of the GV Dyno replay server and integrate them with the SAM LiveTouch replay and highlight system. The goal is to ultimately create a replay system that will be attractive to production-truck vendors as well as to traditional broadcast facilities. Quantum’s Xcellis Scale-out NAS combines robust media and metadata management with scalability. Quantum is highlighting its new Xcellis Scale-out NAS, which delivers the high levels of storage performance and scalability in a cost-effective, Ethernet-based appliance. Powered by Quantum’s StorNext shared-storage and data-management platform, the multiprotocol, multiclient Xcellis Scale-out NAS appliance unites robust media and metadata management with scalability to support content creators’ most demanding collaborative workflows and ease their transition to IP-based infrastructure. Quantum says a single Xcellis Scale-out NAS system performs up to three times better than the market’s next-best NAS offering. 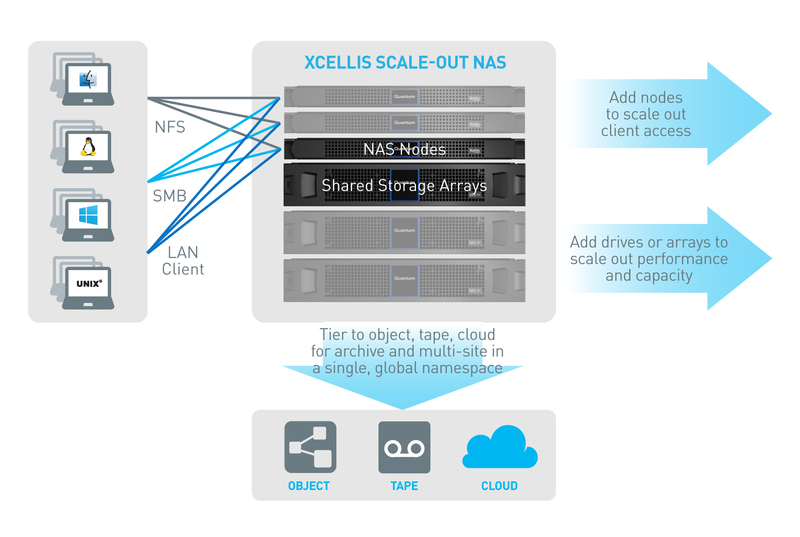 An Xcellis NAS cluster can scale performance and capacity together or independently to reach hundreds of petabytes in capacity and more than a terabyte per second in performance. Hitomi is hitting Las Vegas with the U.S. debut of xFrame. Launched at IBC last year, the modular 1RU frame enabling expansion and future-proofing hosts up to four MatchBox modules of any combination. xFrame boasts a distributed frame reference and single Ethernet control interface for access to all MatchBox modules. “Customers can buy a single card and build up as their requirements grow and can even upgrade it when it’s on and live,” says Director Russell Johnson. “It’s completely hot-swappable.” The company has also launched an analog-out audio option for eight channels. It was built for CNN and is now available commercially. “The world is going to everything streaming; OTT is going to be the future,” says Scott Murray, VP, product management, Telestream. “We are positioning ourselves to be the go-to company for everything live and VoD. We’re already there with VoD, and now we’re working on live. As part of that, we’re working with Fox Sports for the World Cup. Fox Sports is sending back live content from the World Cup to Los Angeles in real time over the public internet with just a 10-second delay, so editors can create their highlights shows. This is really killer stuff.” The solution comprises Telestream’s Lightspeed Live Capture, plus Aspera’s Faspstream, which creates a “tunnel” though the public internet. “The cost savings are staggering,” Murray adds. Axon Digital Design and Arista Networks are using NAB 2018 to demonstrate a live sports IP infrastructure. The showcase, in which a traditional SDI router has been replaced with an IP infrastructure, features Axon’s Synapse IP control solutions and Synview IP multiviewer, all managed by the Cerebrum control platform. Visitors to the booth can experience a scaled-down live demonstration of an operation by a leading production company for a recent major international sports event. This original setup consisted of multiple Arista 7050SX-64 switches in a leaf-spine configuration, combined with Axon’s Synapse IP bridges (NIO440) to convert to and from SDI and controlled through Axon’s Cerebrum control and monitoring system. To feed IP signals directly to Axon’s Synview multiviewer, Synapse MNU100 modules were equipped with Synapse NIO440 converting SDI signals to IP for display on the multiview wall. IBM Aspera is showcasing enhancements to its Streaming for Video solution. Building on its FASPStream protocol, this latest evolution enables live and near-live video streaming at high quality with no added latency over commodity internet with low-touch deployment and centralized administration using existing video infrastructure. Aspera Streaming for Video enables centralized, real-time production of high-bitrate programming, eliminating the need to co-locate costly production staff at remote venues. Also unveiled at the show is IBM Aspera on Cloud, a hosted service that provides a fast way to transfer, exchange, and deliver content from any location to anywhere with anyone. Files that need to be exchanged are often stored in multiple clouds and on-premises systems. Traditional transfer technologies bridging these environments can be slow and unreliable. IBM Aspera on Cloud overcomes the file-transfer challenges of the hybrid cloud by allowing media companies to securely and reliably move their content across on-premises and multi-cloud environments at high speed. IHSE is routing a fiber link between its booth and EVS’s to demonstrate long-distance connectivity using dual EVS LSM remote-control panels at a single workstation. Dalet Digital Media Systems is unveiling the latest version of its Dalet Galaxy MAM and workflow-orchestration system. The Dalet Galaxy Five release enhances workflow orchestration and focuses on four core pillars: AI framework (dubbed the Dalet Media Cortex), a new social-media framework, increased hybrid cloud/on-premises workflows (including new integrations with AWS), and increased component-based workflows (including extended IMF capabilities). According to VP, Marketing, Arnaud Elnecave, the Dalet Media Cortex AI functionality provides users with new tools for cognitive content creation, content recommendation, audience analytics, and predictive analytics. NEP’s offerings are designed to change attendees’ perception of a company traditionally viewed through the lens of remote production. First up is a presentation by NEP The Netherlands on the company’s advances in virtual-studio technology. With a render engine from Zero Density, the team at NEP built an integration level and has hired designers to build realistic studio environments that can also have localized virtual graphics and ad insertion, providing a way to drive new revenue from the virtual studio. Also check out NEP Media Services Norway for an overview of Media Bank, the asset-management facility that Eurosport relied on for the PyeongChang Winter Olympics. Media Bank’s flexibility allows customers to develop a customized system for asset management, content delivery, and much more. Yospace is here at NAB 2018 talking about live dynamic ad insertion and the issues involved in bringing both scale and personalization to any device a viewer wishes to watch content on. Says CEO Tim Sewell, “It can be very difficult to scale live dynamic ad insertion, as you’re bringing in personalization. However, as we have been doing this for a long time, our architecture has evolved. We are now at the point where audiences are growing and we are bought in because less experienced companies have not known what is needed.” The company is also talking about its overall stream-management focus. First-time NAB Show exhibitor V-Nova is showcasing its demonstrations with partners Mainstreaming, Xilinx, and uCast at the show. uCast has integrated the Perseus Plus codec into its platform for internet TV services to improve the quality of experience for viewers and reduce the cost because it will run on a fraction of the bandwidth. The company is also talking about the addition of new machine-learning capabilities to the Perseus Pro codec, which powers the P.Link dual UHD/8HD video encoder/decoder. By incorporating machine learning and convolutional neural networks, Perseus Pro has been trained to identify common video features, so the amount of residual data required for reconstruction is reduced. Exhibiting in the Connected Media Arena, Globecast continues to evolve services and solutions for an increasingly IP-centric environment. According to CTO/COO Sylvain Merle, Globecast is developing its new products and solutions based on “a customer-centric approach.” This includes the recent introduction of My Globecast digital portal, which operates in real time and provides access to a full range of the company’s services. At the show, the company is launching its Optim’Net CDN offloading solution that integrates with any CDN vendor. Benefits include improved network performance and a reduced start time for media playback. Globecast is also showcasing its recently launched Disaster Recovery Playout Services based in its Culver City Media Center. It provides infrastructure, personnel, and expertise to manage low-cost disaster-recovery feeds for primary networks. SES is launching its Ultra HD platform into Latin America to accelerate commercial 4K rollouts in advance of the 2018 FIFA World Cup. The new SES Latin America Ultra HD solution will be distributed over multiple satellites and open with four Ultra HD channels, including NASA TV UHD (produced by Harmonic) and the SES Ultra HD demo channel, an incubator for emerging 4K content producers. According to VP, Business Development, Steve Corda, SES plans to add new channels and content produced in Brazil, Mexico, and other Latin American countries. This NAB Show marks a transition in the history of The Switch. According to EVP, Marketing and Corporate Communications, Rich Wolf, the company is expanding its traditional role as a provider of a deeply rich transmission network to one as a full-service content supplier. Other services are being stacked on that network to provide more value, including The Switch At-Home (which provides at-home production services) and The Switch OTT. Limelight Networks is helping lead the conversation and the innovation around low-latency streaming, especially in live sports production. Senior Director, Product and Solution Marketing, Mike Milligan cites the new WebRTC-based sub-second latency live-streaming solution as a major feature at the company’s booth. According to the company, the solution allows video to be streamed from anywhere in the world with just a single second of latency. Blackmagic CEO Grant Patty at Blackmagic Design’s NAB press conference on Monday. Although the new Pocket Cinema Camera 4K stole much of the spotlight at Blackmagic Design’s press conference Monday morning, the company’s new ATEM Television Studio Pro 4K live-production switcher was the biggest announcement related to live sports production. The all-in-one switcher (available now priced at $2,995) features eight independent 12G-SDI inputs, a built-in Fairlight audio mixer, and an ATEM Advanced Chroma Keyer. Other big news from Blackmagic at the show includes the new Blackmagic MultiView 4 HD multiviewer, the DaVinci Resolve 15 software update, and a range of updates to several of its converters. NewTek has announced LiveGraphics, a new approach to the creation of real-time motion graphics that does not require a proprietary hardware graphics engine. With NewTek LiveGraphics, content authored in Adobe Photoshop CC and Adobe After Effects CC is available for live output from TriCaster TC1 and NewTek IP Series with fully replaceable text and images that can be driven by live data and web content. LiveGraphics delivers on the promise of Adobe Creative Cloud in real time. At the show, NewTek has also announced its NC1 Studio I/O IP module, four-channel SMPTE ST 2110 connectivity for TriCaster TC1, and NewTek IP Series. AWS Elemental is demonstrating the integration of its media services with AWS machine learning to help sports-video producers enhance workflows with automated capabilities. Media services integrates with Amazon Rekognition, Transcribe and Translate, with 83%-94% accuracy. Says CMO Keith Wymbs, “Media Services is a category in the AWS console that allows customers of any size to take advantage of our services in the cloud as SaaS. We are now combining that with machine learning.” AWS Elemental is also debuting Quality-Defined Variable Bitrate (QVBR) control. 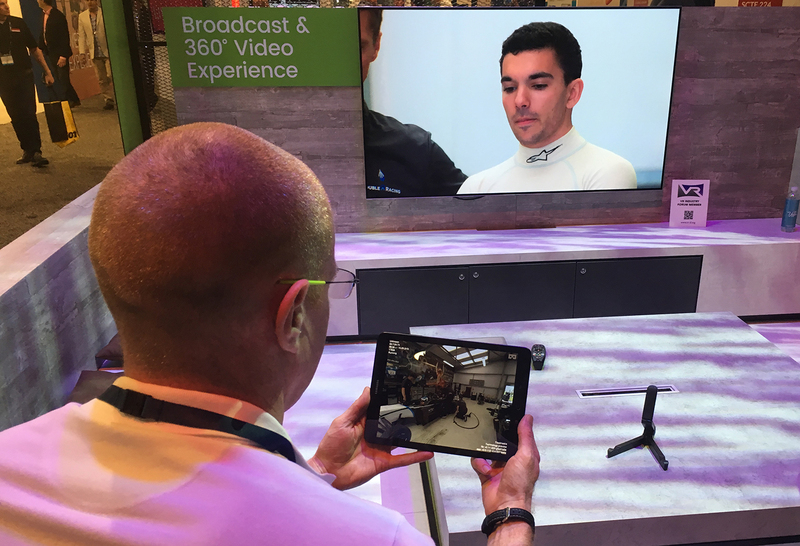 Ericsson’s VR/360 demo syncs with a main TV screen (in conjunction with Tiledmedia) that uses its HEVC 360 live encoder and features Formula 3 content. Ericsson is looking to launch a new era at NAB 2018 following recent investment from One Equity Partners. In terms of attractions at the booth, the company has a VR/360 demo synced with a main TV screen (in conjunction with Tiledmedia) that uses its HEVC 360 live encoder and features Formula 3 content (building on a similar demo at IBC2017 in which the encoder was not live). In addition, Ericsson is debuting its end-to-end UHD ecosystem, a new contribution solution specifically for at-home production (a 1RU AVP encoder/decoder that can transport up to 16 video paths), Distributed Cloud Contribution architecture, and an MPEG-H contribution encoder for next-gen audio. With the move to IP top of mind in Vegas, Cisco is touting its Cisco Media Blueprint and IP Fabric for Media. The company announced that it will launch IP Broadcast Training programs in mid 2018 and is launching an interoperability-lab partnership for media applications and workflows with Intel. Other highlights at the booth include Cisco CloudCenter to help manage hybrid IT and multi-cloud environments, AppDynamics for application performance management, and new Ask the Expert collaboration solutions. Friend MTS is launching a 4K/UHD watermarking and monitoring service at NAB 2018. The service is geared toward sports and entertainment applications with particular focus on the illegal streaming of live pay-per-view sports content. The ASiD Watermarking and Monitoring Service operates across all pay-TV platforms: satellite, cable, IPTV, and OTT. Illegally streamed 4K content can be automatically identified within seconds using fingerprint-based content recognition. The content can then be taken down within 5 minutes. Friend MTS clients include NBC, Sky, Perform, Premier League, and BT Sport. Live demos of the service are being offered at the booth. Media Links is highlighting its MD8000 flyaway kits that support remote video and data services adaptable to almost all video formats and network bandwidths, whether working in J2K, H.264, SDI, or 4K. Also featured are Occasional Use Network Solutions for broadcasters that require on-demand access to the same IP network and technologies as Tier 1 fixed services but only when required. Alongside technical highlights, NAB 2018 is seeing the launch of Media Links’ Global Partner program with specialist system integrators. The program is specifically designed to bring Media Links’ solutions closer to local and certified implementation teams. Fraunhofer’s MPEG-H codec, which was first deployed by three Korean broadcast networks for the recent Winter Olympics, will also be used in South Korea for the upcoming World Cup event, with source audio coming from the host broadcaster onsite and processed through the Fraunhofer codec. “We’ve accumulated a lot of experience in broadcast-sports audio since 2015, when we did our first sports broadcast,” says Robert Bleidt, GM, Audio and Multimedia Division. Having debuted at IBC2017, Clearcaster, the new Facebook Live streaming solution from Wowza Media Systems, is on display at NAB 2018 with a bevy of upgrades. The solution provided support for shoulder programming at the recent NCAA March Madness tournament. According to Senior Solutions Engineer Tim Dougherty, Wowza Streaming Cloud also remains a popular technology among the company’s sports clients. The Video Call Center is building on its successful video-call–acquisition and show-building technology with the addition of Call Manager Pro. The new software allows calls to be received, screened, and optimized from virtually anywhere while a host moderates the show from any remote location. CEO Larry Thaler believes this breaks down the brick-and-mortar barriers that may have limited the company’s solutions in the past, making the product a viable solution in virtually any environment. After making some noise at NAB 2017 with solution that places a sports scorebug inside a camera, SportZcast is back with its own booth and increased customizability of its solution. Among the highlights of this year’s additions are SportZcast Control Room, which offers remote control of a single- or multiple-camera production from a laptop. When one of the company’s Score Bots (which link natively into any sports facility’s scoreboard) is connected, broadcasts produced through Control Room can have real-time scoring and ad insertion automatically controlled through the barrier-breaking technology. Cloud-based video-delivery breakout Grabyo has seen rapid growth, thanks to its social-media–clipping solutions. Now the company is expanding even further with added capabilities behind Grabyo Producer. According to CEO Gareth Capon, the platform enables browser-based support of digital production, with graphics, ads, live polling, and more inserted via simple clicks of a mouse. The company is also showing the results of its recently announced partnership with Singular.Live and Reality Check Systems that enables addition of more-advanced live graphics to shows put together via Grabyo Producer. Grabyo also recently worked with Eurosport on numerous digital productions at the PyeongChang Winter Olympics. Click here for SportsTechBuzz at NAB 2018 in Review: Central Hall. Click here for SportsTechBuzz at NAB 2018 in Review: North Hall, Outside/Mobile, More. SportsTechBuzz was compiled by SVG’s Ken Kerschbaumer, Jason Dachman, Brandon Costa, Karen Hogan Ketchum, and Dan Daley and SVG Europe’s Fergal Ringrose and Heather McLean.